Ok so IBM dropped Sun on the floor only to have Oracle snap them up (surely a nice bidding war would have been the least they could do for a competitor?). Interesting, and I would say clever move, especially off the back of beating the hell out of cloud computing last year (another potentially more-intelligent-than-it-looked-at-the-time maneuver). This acquisition touches many parts of the industry and the ramifications could be quite significant. Fortunately we’re not all being alarmist about it and Ars Technica for one have good, balanced coverage in their Oracle buys Sun: understanding the impact on open source article (albeit with a pesky rel=shorturl link which is only marginally better than rev=canonical). End user hardware and software (desktop systems, OpenSolaris on the desktop, JavaFX, etc.) will go. Mobile related software will go – iPhone and Android have essentially won that battle and if Java’s to have a stake it will be by way of another company. Sun Ray thin clients might survive because of Oracle’s history with network computers (even if in a world of netbooks and nettops this probably isn’t entirely sensible). Important (for us but not necessarily for them) products like OpenOffice could slip between the cracks, but more likely they’ll go on the back burner and little will change. MySQL will survive, despite what the fear mongerers are saying. There’s likely a lot of opportunity for them in the services, espeically if it can be made to play well with its new older step-brother. Nonetheless there will be renewed interest in other projects like PostgreSQL and Drizzle, which can only be a good thing for the rest of us. Let’s not forget that it’s been rocky for MySQL for a while so this change is probably better than many of the alternatives. 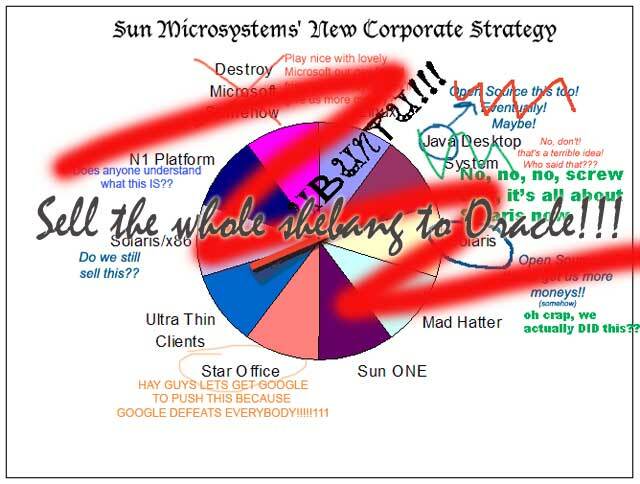 Java will be cleaned and/or opened up as while Sun have been perhaps the only company not to have made a bunch of money out of it, Oracle don’t have that concern and can only benefit (in terms of mindshare moreso than money) by further adoption. If not someone else will likely go and do it anyway and what’s sure is that status quo is untenable. Will be interesting to see what role, if any, Apache Harmony plays. In terms of cloud computing the Compute/Network/Storage triple may be consolidated under the Q-Layer software, resulting in a compelling cloud computing infrastructure offering. Even if that’s by no means guaranteed I reckon they’d do well to have a crack at it anyway. Virtualisation technology as well as middleware like their identity and systems management software will help here and the result could well become a force to be reckoned with. Oracle are no stranger to grid computing and have tech like OCFS floating around already, so between them and the Sun engineers they may have what it takes to pull this off. An Amazon EC2 competitor following on from the network.com offering may or may not still appear, but either way there will be similar offerings for their large enterprise clients. All in all, if they play their cards right Oracle could well end up being a major cloud computing player along with the likes of Amazon, Google and Salesforce. We could all end up beneficiaries too by way of improvements to both Linux and Java, or it could go very badly wrong. I don’t plan to think about it much more as there’s little we can do but wait and see.